Statewide. Milk snakes belong to the kingsnake genus and, like kingsnakes, will eat other reptiles, but usually preys on rodents. 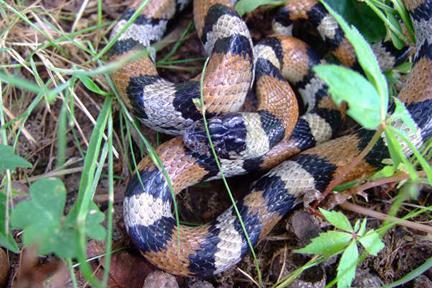 Oklahoma has three varieties, or subspecies, of milk snakes: the central plains milk snake (L. triangulum gentilis, pictured above) throughout western and central Oklahoma, the red milk snake (L. t. syspila) in the eastern 1/4 of state except for extreme southeast, and the Louisiana milk snake (L. t. amaura) in the extreme southeast portion of the state. 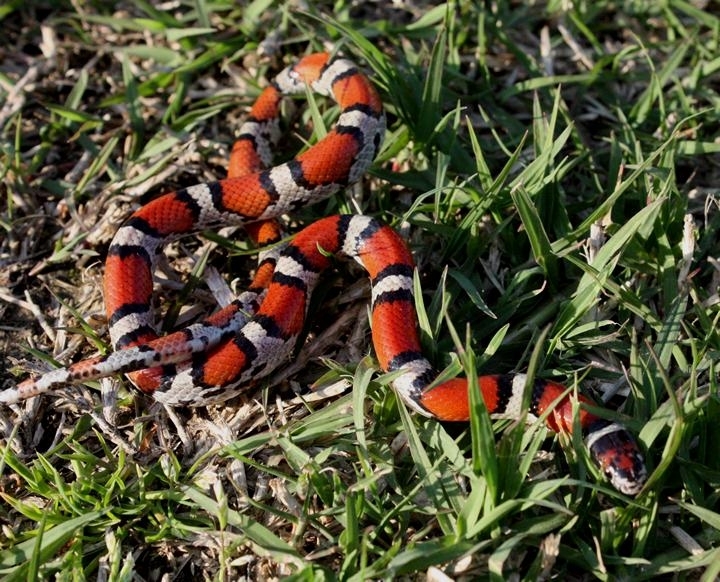 The name milk snake is a misnomer, named for their habit of hanging around barns. Early pioneers gave them the name "milk snake" since they thought the snakes were milking their cattle. In fact, since barns are places to store seed and hay, the barns attract rodents, and in turn, attract snakes that eat rodents, like the milk snakes. *Notice the broader red blotches.